I recently returned from a five-day trip to Chicago to attend a convention. In many ways, Chicago is a wonderful city, full of opportunities to explore unique skyscrapers, world-class museums, fabulous restaurants, exclusive stores, and the glitz and glamor that only a renowned metropolis has to offer. But, alas, it is a big city, and I am a country boy at heart. So while it was great to get away for a few days and take in the excitement, I was certainly ready to return home when the time came. I stayed at the Embassy Suites on Columbus Drive near the river and near the “magnificent mile” of North Michigan Avenue. Five of us checked into the hotel on Sunday night; we each had our own suite. It was almost a bit much for me—I would have been happy to have shared a suite. I didn’t pay much attention to the room assignments until we got on the elevator and someone mentioned that four of us were on the thirteenth floor. At first I thought this was a joke, as I had always heard that hotels don’t have a thirteenth floor; rather, floors skip over floor thirteen, going from the twelfth floor directly to the fourteenth floor. I’m not sure how I originally came by my information, but it was apparent at that moment in the elevator that I was certainly mistaken. Hotels do, indeed, have a thirteenth floor—at least this one does. Well, we got off the elevator and it was then that I looked at my key-card folder. I was just briefly unnerved as I saw that my room was—are you ready?—room 1313! Now if I were the superstitious sort, I probably would have headed right then back to the elevator and back to the front desk to ask for a different room. But, instead, we all just had a good laugh at my apparent misfortune—and my impending doom! Well, of course, I had no bad luck at all last week. In fact, it was a great week and a great break from the old routine. We had some phenomenal meals and hobnobbed with tons of people. 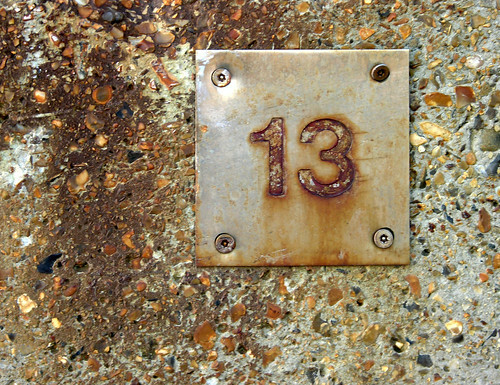 However, there is one thing that I do regret, and it is certainly an unfortunate event: We checked out on Thursday, March 12; had we stayed one more day, I could have stayed on the thirteenth floor in room 1313—on Friday the thirteenth! Whew–sounds like you got out of there just in the nick of time!